Calvary Cemetery, a non-profit Christian Cemetery, has been serving the Fond du Lac area since 1889. All faiths are welcome! 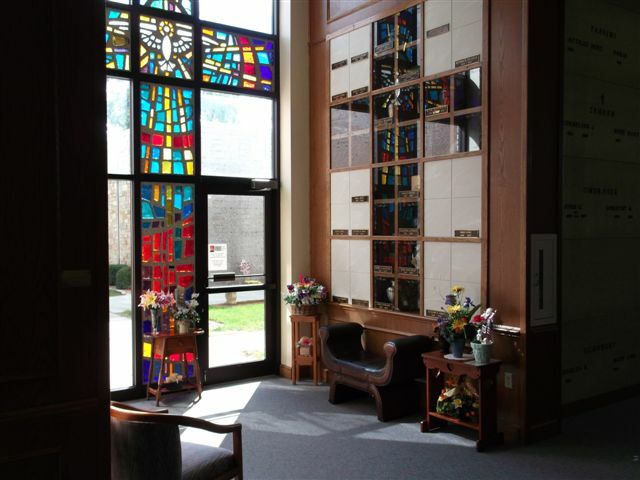 Niches and burial crypts became an option in the fall of 1980 when The Chapel of the Risen Christ Mausoleum was dedicated with a large chapel, indoor, and outside crypts and niches. Building phases two, three and four took place in 1986, 1994 and 1998 respectively, resulting in an indoor mausoleum, new office space, a board room, and outside courtyard garden crypts. The staff and board of directors are proud of the two recent additions that have taken place on the property to accommodate cremated remains. The Cross of Calvary Cremation Garden was developed in the Spring fo 2009. The garden allows for cremains to be buried and includes a cross walkway centered by a 10-foot black monument and benches. in the community since 1889"
as well as the mausoleum. As more and more people plan ahead for their final resting place, niches are growing in popularity. 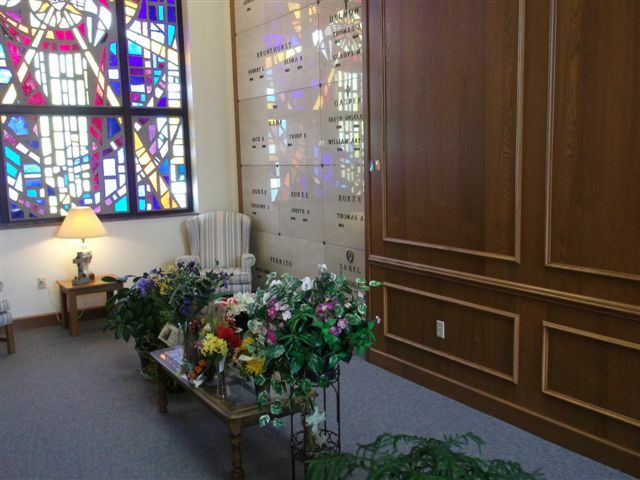 Niches provide memorialization of cremated remains. 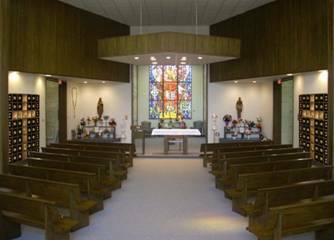 "We have niches that were built in 1980 during our original first phase," said Ms. Lange, general manager of Calvary Cemetery and Mausoleum. "But, at that time, they were used by a very small percentage." The economy and a new generation have sparked the trend's growth. "Every year I do an inventory of what we've sold - inside, outside, cremation, entombment and full burials," Ms. Lange said. "Cremation is at 40 percent and climbing. Traditionally, our parents and grandparents wanted to be buried, but there has been a change in thinking,and the younger generation is more open to cremation & entombment in a crypt." People are also thinking in terms of space. "They don't want to use up a lot of space for burials," Ms. Lange, said. Finances also play a part. "There is a savings over a full burial," she said, "Entombment is about two thirds of the total cost of in ground burial." Lange said it is important to offer many options to her customers. "It is a matter of personal preferences and what the family is comfortable with," she said. "We have to cover all the bases." Much of her time is spent meeting with customers about future plans. In fact, approximately 87 percent of their business comes from pre-sales. "Only 12 to 15 percent is when there is a family emergency or tragedy," she said. People of all ages make arrangements for their final resting place years ahead of death. "The majority are probably age 45 to 65," she said. "Often after a family emergency, they become aware of the importance in planning ahead. The main reason for doing so this is that family members don't have to worry about making these decisions on the worst day of their lives." She said pre-planning is also a good financial decision. "It is wise because you lock in today's prices," she said. "Twenty years from now, who knows what things are going to cost?" Lange does know that Calvary Cemetery and Mausoleum will be serving many generations to come. "We take great pride in the upkeep and maintenance of our cemetery and mausoleum" she said. "We are financially sound due to the wisdom of our board of directors, the success of our sales programs and investments. We are not corporate owned and are a non-profit association of lot of crypt owners." Garden sites include a memorial marker, foundation, a decorative vase, and emblem. The garden is also home to an American flag flying on a 20-foot lighted pole. "We have six 15-foot poles added to the garden as well." "We have flags of all the armed services plus the POW flag. We might be the only cemetery to have those flags flying side-by-side with the American Flag. That was one thing we were missing - something to honor all the veterans that have given their lives." The cost of this project was all offset by donations. The second project completed in October 2010, offers a "contemporary solution to accommodate the growing need for cremations." On the walls of the chapel, on both sides of the pews, niches were added, with some niche fronts see-through to form the shape of a cross and the rest opaque . 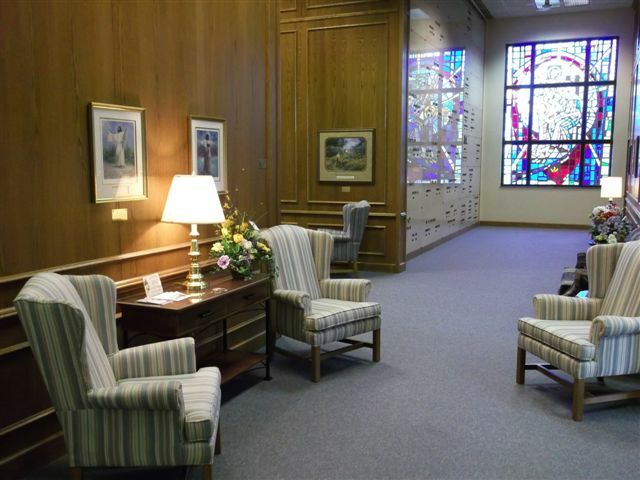 "The niches were added to existing walls within the chapel," Mrs. Lange, said. "They blend into the chapel like they were meant to be. It is like buying a china cabinet to enhance the beauty of your dining room. That is what we did here." More information is available by calling 920-923-2202 or email us.